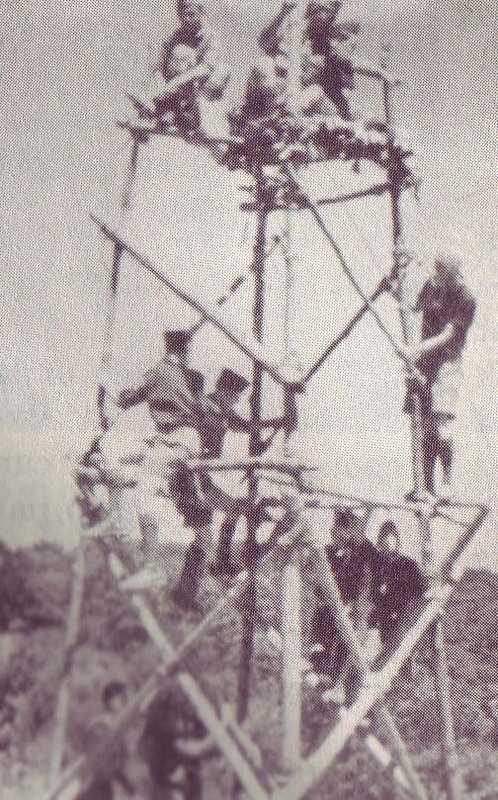 Pioneering (in Scouting) is the art of using ropes and wooden spars joined by lashings and knots to create a structure. Pioneering can be used for constructing small items such as camp gadgets up to larger structures such as bridges and towers. These may be recreational, decorative, or functional. In camp, Scouts may construct functional items like tables, camp dressers and gadgets, as well as decorative camp gateways. Pioneering is a common merit badge in many countries, and was required for the Eagle Scout rank in the 1920s and 1930s. The name comes from the 18th and 19th century military engineers who went ahead of an army to “pioneer” a route, which could involve building bridges and towers with rope and timber (for example the Royal Pioneer Corps). Pioneering skills include Knot tying (tying ropes together), lashing (tying spars together with rope), whipping (binding the end of a rope with thin twine), splicing (joining or binding the end of a rope using its own fibres), and skills related to the use, care and storage of ropes, spars and related pioneering equipment. Building any good camp gadget requires at least some basic skills in Scoutcraft, e.g. proper use of wood tools, tying basic knots, simple lashings. At Boy Scout Summer Camp, these camp gadgets are often referred to as “campsite improvements.” A good camp gadget should be durable, aesthetically pleasing, and serve a purpose. There are numerous designs and ideas: Favorite Camp Gadgets.